Ah, Dirge. Poor, poor Dirge. 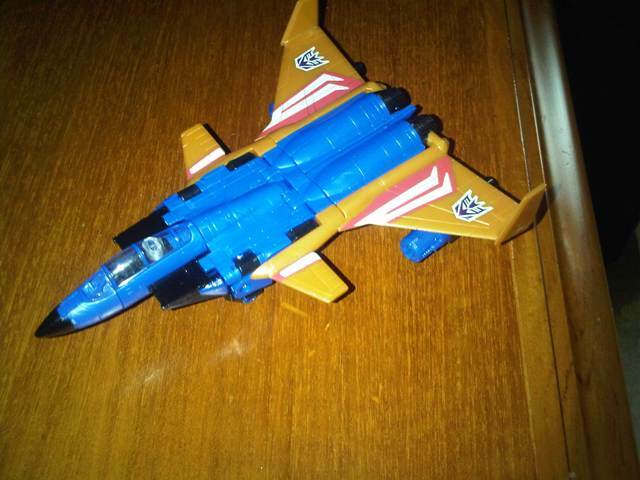 See, Dirge was part of the second set of Seeker jets. This trio had all new wings and guns, and they are drawn and portrayed with their coneheads pointing upwards to differentiate them from Starscream, Skywarp and Thundercracker. However, the Coneheads were mostly background characters. The only one with any sort of major appearance was Ramjet in his IDW spotlight issue. Otherwise, Ramjet, Thrust and Dirge are either background crowd, or cannon fodder. Dirge, in particular, had a habit of being killed, moreso than Ramjet or Thrust. Appropriate, since Dirge's name basically means 'funeral song'. Dirge's career was very undignified, even for a background character. In the cartoon, he was your standard background Decepticon goon who never got anything cool to do. In the 1986 Movie, Unicron totally ate him and his Conehead buddies... but Dirge showed up fine in Season three, only to be killed by Ultra Magnus alongside Ramjet. Both Coneheads would reappear later in Season Three, though, despite a marker being made for Dirge in the Decepticon Crypt. In the comic, none of the Coneheads actually did anything significant. Dirge did use his fear power. Once. In the US continuity Dirge got blown up by Serpentor in the GI Joe crossover. Rather stupidly too, I might add. The UK continuity ignores the crossover, so Dirge kept cropping up as a background character, although the guy never did anything much. In Devil Due's GI Joe/Transformers series, Dirge was killed by a solar satellite. Someone forgot he died, then he reappeared again... to die. The BotCon exclusive Classics comic had Dirge be brainwashed and later killed, even though he was one of the exclusive toys that year. In the Dreamwave comics reboot of G1, Dirge appeared as a background character constantly, and surprisingly he did not die. In the G1 title, that is. In the Armada series G1 Dirge cameoed as one of Unicron's heralds. He was blown up. IDW took the license, but Dirge was killed in his first appearance... without even getting a line. In a flashback, to boot. Dirge's namesakes didn't fare better. The name Dirge was reused in Japan's Beast Wars II for a Predacon jet. I haven't watched the series but apparently Dirge was basically cannon fodder. Not even an upgrade into a mutated half-zombified wasp and a rename into Dirgegun could save him. In the G1/BW Timelines 'Descent to Evil' fanclub exclusive set, an Insecticon named Dirge was included. He was a generic, and as such in the accompanying fiction he wastes no time in getting pasted. Dirge's Shattered Glass version did not fare better. A cheerful soul, SG Dirge apparently worked for Alpha Trion's cultists, and got himself killed by a bunch of guys who were supposed to be part of the Thirteen or something. In Animated, Dirge was a toy-only character, a clone representing Starscream's greed. ROTF gave us a new mold homaging Dirge in the Movie aesthetic, but in his appearances Dirge always gets the shaft, so to speak. Poor Dirge. Still, despite never doing anything, the Coneheads benefit from the fact that the Seekers have a cult following. And since all Hasbro needed to do was to retool/redeco the Starscream of the line, they are always happy to oblige. Thus, this trend has been carried over to the Classics line. 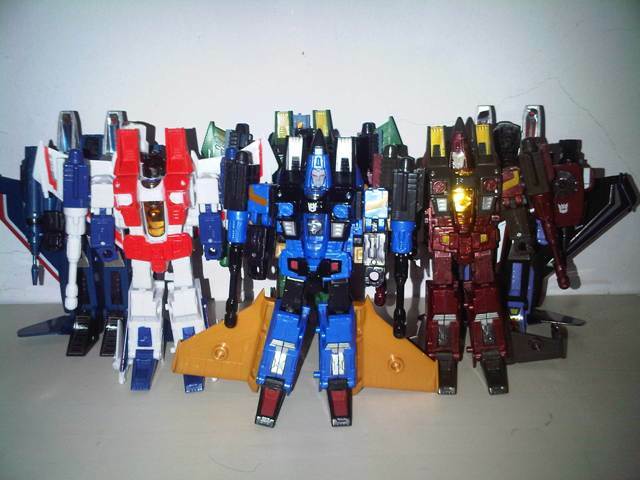 Ramjet was released in the first Classics line, and both Thrust and Dirge were released as BotCon exclusives, as well as store exclusives in Japan. 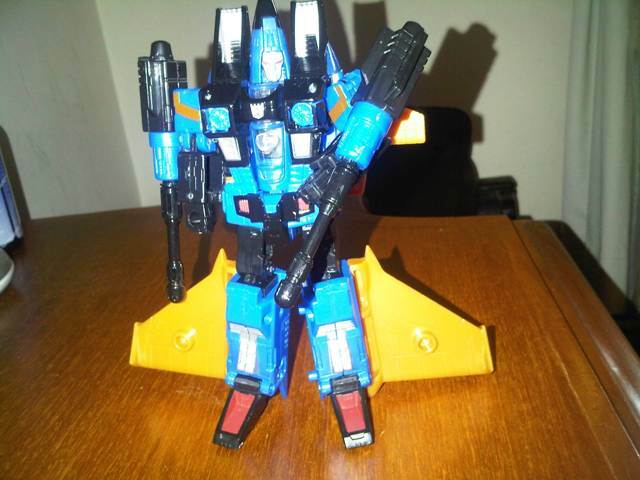 For Dirge, the BotCon exclusive (horrendously expensive in eBay) was nothing more than a simple repaint of Ramjet, while Henkei casted new wings to better homage G1. The Henkei version wasn't cheap either. Hasbro seems to want to piss on the fanclub exclusive things, though, since they released Thrust as part of the first wave of Generations. Dirge followed soon afterwards, and that's where I got him. I have a weakness for Seekers, even though I've got several copies of this mold. Now Dirge is part of my growing Classics/G1 collection, ready to be bifurcated by the Autobots whenever I muck around with my toys. Dirge transforms into a modified F15 Eagle Fighter jet. The proper shape of a F15 would be like Starscream and his repaints, but Dirge had gotten himself new wings. two large triangular wings jut out from along his engines, and the tips end up pointing perpendicularly. Two smaller wings that honestly doesn't seem to be able to do much good are placed further forwards. I remembered reading somewhere that the Coneheads' alternate modes were based on real prototypes for modified F15 jets which were unproduced. No idea if this is true, but Dirge is cool-looking nevertheless. Dirge's main colour is a shade of blue that is comfortably deep enough without being too close to black. His wings are yellow with a slight golden tinge. Black colours his nosecone, the inside of his cockpit, the sides of the cockpit, the afterburners and several other bits are coloured black. The sides of his air intake thingies are done in a darker shade of blue, but it's not noticeable. Unlike his G1 self, Dirge has been decorated a little, with a red-and-white motif through his two wings. No idea what that's supposed to represent other than being just cool. Two Decepticon insignia are placed on the larger wings. My Dirge has a erroneous Decepticon insignia � the white triangle in the middle of the crest is missing. This was fixed in later samples of Dirge, but it pisses me off anyway. Like Thrust, Dirge came with the two missile launchers that originally came with Starscream. They're attached under his wings, naturally. This is a little bit of a shame, since Dirge would've looked more like his original toy if they had included Ramjet's big honking missiles instead. But you can't have everything, can you? Seen from the bottom, well... Dirge doesn't really try to hide stuff. His face is as plain as day under his cockpit, while his robot mode torso and hips are very evident. But then, he looks excellent from the top, which is what really counts, right? The vehicle mode is made out of pure win. Dirge looks like his original design, only better because his wings are now actually attached to his body instead of hanging out by a bit. In robot mode, Dirge doesn't quite look as messy as Thrust, mainly because the dark blue, black and golden yellow all complement each other well. More black appear in this mode, since most of his chest, his lower arms, his crotch and his shins are all black. Part of his shoulders are golden yellow as well. Red and silver appear in subdued tones, too. Blood-red for Dirge's optics, obviously, and on his feet and a bit on his waist. Silver colours the detailing on his lower legs, the interior those things beside his head and the chinks of armour under the turbine. A tiny Decepticon symbol (also an erroneous one like before) is tampographed on the center of his chest. Unlike the original Dirge toy, the long wings aren't a single piece, which allows posability. The larger wings stay stuck on Dirge's feet like Ramjet (which look rather silly if you want to be brutally honest) while the smaller ones can fold up a bit and stay attached to Dirge's back. This, so far, makes him my favourite among the Seekers in terms of appearance... even if he does look like he's wearing flares. Dirge's face is cast in a gray that's almost stone-like, and he looks like a morose stone statue if you look at him too long. The cannons can attach to the sides of his shoulders, but the one on the left is so loose (like Acid Storm's) that it would fall off without warning. The cannons could be held on his hands like guns, but that isn't GEEWUN enough. Dirge has about the same amount of articulation as the other Classic Seeker molds. Head can swivel, he has shoulder, elbow, wrist, thigh, knee and limited ankle joints. Respectable but a bit weak compared to the better Deluxe class figures nowadays. Still, this does allow Dirge to form a lot of poses. As a bonus, unlike the other Seekers there are no wings behind his back, so he can have a better range of movement. That's about it, really, that I could say without repeating what I have done for Thrust or Acid Storm. Durability 7/10 Unlike Thrust, Dirge feels slightly flimsier. The joints feel weak and the peg hole on his left shoulder is very, very loose like Acid Storm's. Can we say 'mold degradation'? Although considering how many times the mold had been used, I'm surprised it had managed to stay this long. Transformation Design 8/10 The Classics Seeker mold is well-done. What else is there to say? Aesthetics 9/10 Excellent representation of Dirge. There's absolutely nothing wrong with him... bar the Decepticon insignias. Gah. Articulation 8/10 Okay-ish, I guess. He's got the same points of articulation with Starscream and Thrust, but compared to more recent Deluxe class offerings I can't help but feel kind of shafted. Fun 7/10 Dirge a fun addition as a background goon. He is a fantastic addition to your Classics Decepticon forces. Price/Value 9/10 I got him cheap at a Christmas sale, so he's worth it. The fact that I have three issues of the Classics Seeker mold doesn't matter. Overall 8/10 The Seeker mold is great, and Dirge is a great representation of his character. Sure, not everyone would want to buy Seeker molds, but Dirge is worth getting if you have the cash. For fans of Dirge, or completists in general, this Generations toy is a must-have. And it's much cheaper than importing the Henkei or BotCon one from eBay to boot.